Recently, they have become very popular and nowadays they are consumed all over the world thanks to the presence of various healthy elements. These antioxidants prevent fats present in the seeds irrigation and they can have very positive effects on health. For instance, theycounteract the production of free radicals, which can damage molecules in the cells and contribute to aging and diseases such as cancer. 2. Chia Seeds provide a large amount of nutrients with very few calories (about 101 calories per 28 grams). 3. They contain various vitamins such as Vitamine B1, Vitamine B2 and Vitamine B3. 4. Almost all carbohydrates present in chia seeds are fibers. Accordingly, this should increase the sense of fullness, reducing the food absorption and helping you to eat less. Chia seeds contain 40% by weight of fiber. This makes them one of the best fiber sources in the world. 5. 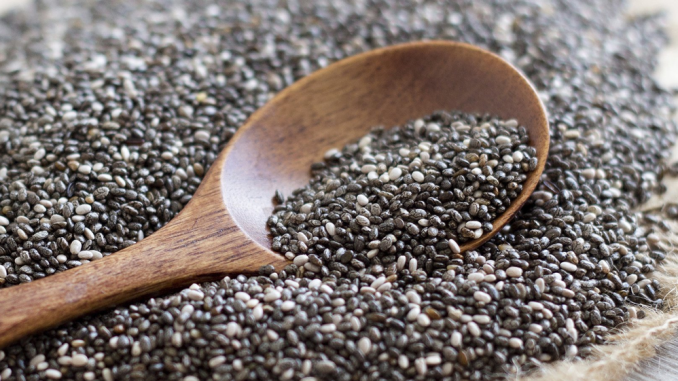 Chia seeds are a great source of proteins and Omega-3, especially for people who eat a few animal products or don’t eat them, following a veg diet. 6. Thanks to their high presence of proteins and their low presence of carbohydrates, Chia seeds can help you to lose weight. 7. Chia seeds can reduce the risk of heart disease and diabetes. 8. Chia seeds are rich in nutrients, which are important for the bones. In fact, they contain calcium (approximately the 18%), phosphorus and magnesium. 9. The seeds have a rather neutral taste, so you can add them to any dish. But how can you eat them? You can eat them raw or baked. If you are a breakfast lover, add them to porridge and puddings, cereals and yogurt. They are also good with vegetables and rice, so you can make delicious salads! In addition, Chia seeds can be a good substitute for eggs in recipes. However, if you are not used to eat many fibers you may have unwanted gastrointestinal effects. Its recommended dose is 20 grams (about one and a half tablespoon) twice a day (not more!). Finally, you have to remember that if you want to lose weight, everything counts in the diet, including lifestyle and everyday behaviors such as sleep and exercise. The addition of Chia seeds in your diet can be just useful, not a miracle. Only combining good food and healthy lifestyle you could have interesting results!